Super hero comics and movies are often predicated on a simple idea: that the super hero has a secret identity no one knows about. While the world may be searching for the masked hero, no one notices the boring lawyer, reporter or coffee barista in plain sight who just happens to have a secret. No one knows that that boring guy or girl they bumped into on the train just saved the earth. It’s a drama that works because the hero knows something the rest of the world doesn’t, leading up to that amazing moment when they take off their mask in front of someone who only knows their boring identity. Having a split identity must be incredibly trying, as our hero is surrounded every day by the clues to the truth, that while they may look like a reporter, at night they don a costume and fight crime. And if the villains ever discover their alter ego, everyone they love will be in danger. That tension drives so many exciting moments. Think of the day when a friend comes over spontaneously and the hero’s signature red gloves are laying on the table. When our hero sees it, to him or her those gloves are like a buzzing beacon shouting to everyone, “This is a hero’s costume and there’s something strange going on!” But to the friend, it just looks like some red bit of clothing and they walk right by it. The hero is surrounded by reminders of their heroic identity, and to them, it must feel like everyone knows their horrible secret. It’s their tell-tale secret. In a way, your employer brand is suffering through that same problem. You work at your company. You spend eight, ten, twelve and more sitting in that office, surrounded by your logo and the reminders that your company is innovative or work-life balance-oriented, or focused on saving the world. It’s clear to you because everything, from how you write an email to the state of your desk, is a reminder of that culture and brand. You think it’s obvious that you’re Superman, but the rest of the world just sees Clark Kent. Unfortunately, what is clear to you because you live it day in and day out is completely opaque to the world. You think it’s obvious that you’re Superman, but the rest of the world just sees Clark Kent. The thing is, Superman was trying very hard to be ignored. He wanted to make sure his secret identity stayed a secret so that he could spend his days as a mere mortal, trying to get Lois Lane to notice him. 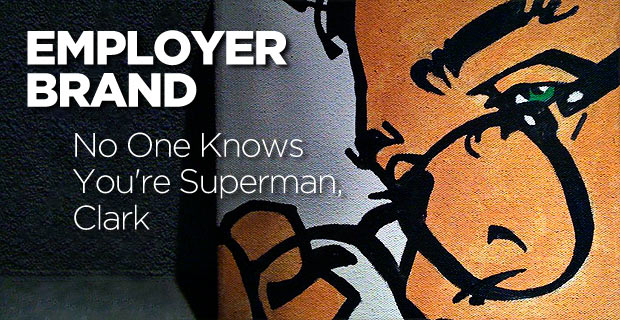 I can’t think of a single brand that should emulate Clark Kent and keep their employer brand a secret. But as often as I might say this, you will likely say, “I totally agree! Luckily everyone knows who we are!” And that’s where the real problems happen. Because you’re surrounded by the reminders of your brand and your employer brand, because you touch these every hour of every day, you get convinced that everyone knows what you know. This feeling intensifies when you’ve surrounded yourself with people like co-workers and family who feel the same way. If you like knitting, you might browse knitting forums and make friends who are into knitting. Almost without realizing it, you’ll have removed non-knitting elements from your life and replaced them with definitively pro-knitting elements. It won’t take long before you start to assume that everyone is as aware of knitting and cares as much as you do. But they aren’t. I think of my friends who are very political, who watch shows and read websites that agree with their beliefs. Suddenly, their Facebook news feeds are filled with aggressively political screeds that assume you know all the references that they make and care about these things the same way they do. The truth is that most prospects have no idea what you stand for. Why? Because you don’t see things the way your prospects see them. How many times have you looked at your career site? I bet many of you could recite every word on the home page, simply because you went over this again and again with your creative team. You know the story behind every picture, page and period because your blood, sweat and tears went into it. But a prospect might spend five seconds glancing at the page on their way to what they really want. If you look at your analytics, you might see that as much as 80% of your traffic never sees the home page at all. Just because you know everything about your company doesn’t mean anyone else does. How much can your candidate really know about you if they don’t see any of that? Remember, a candidate is either looking for a job or content that validates their interest in a job (you didn’t think anyone was reading your About Us page, did you? ), and anything else gets ignored. You can’t just take off the glasses in the hopes that people will see the super hero in front of them. You need to announce it, and insinuate that information on every page of your career site. You need to hold events that support that idea. You need to promote that idea actively, making sure every word choice and photo selection is aligned to the fact that you are a super hero. That’s how you activate your employer brand, by making it not only the foundation of who you are, but in making it a key element in every communication you make. If you ignore this part, no one will discover how amazing you really are.